"Alexander Archipenko: Vision and Continuity"
Northampton, MA - In the first two decades of the twentieth century Paris was a dynamic center of the arts. It was home to artists Picasso and Matisse, as well as other creative minds who gathered at Gertrude Stein's salons to discuss art, science, literature, and related topics. In 1908, it was to the French capital that the young Alexander Archipenko, who had studied art in Kyiv, Ukraine, and in Moscow, went to distinguish himself as an artist. Alexander Archipenko: Vision and Continuity, a major retrospective exhibition on view at the Smith College Museum of Art from March 31 to July 30, 2006, traces Archipenko's work across his career, revealing the artist as an influential force in the history of modern art. In April 2005, Alexander Archipenko: Vision and Continuity opened as the inaugural exhibition of the Ukrainian Museum in its new building and new location on New York's lower east side. The majority of its over 60 sculptures and sculpto-paintings are from the collection of Frances Archipenko Gray, the artist's widow. 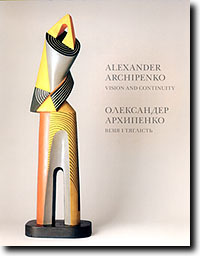 Dr. Jaroslaw Leshko, Professor Emeritus of Art History at Smith College in Northampton, Massachusetts, is the curator of the Alexander Archipenko exhibition and the author of the comprehensive analytical essay in the exhibition's fully illustrated, bilingual (English-Ukrainian), 180-page catalogue. Professor Leshko has organized the exhibition around four dominant concepts: Content into Form; Space in Form; Motion and Stasis; Construction, Material, Color. "This approach allows the visitor to explore vital continuities in Archipenko's art," says Professor Leshko, "since each of these rubrics was revisited and reinterpreted in every phase of his career." It also allows for striking juxtapositions across time, underscoring a continuous, evolving artistic vision. Following his arrival in Paris in 1908, Archipenko spent over a decade studying, creating, and teaching art there before moving to Berlin, Germany, in 1921. He moved to the United States in 1923, becoming a U.S. citizen in 1929, and remained there until his death in 1964. Active as an educator as well as an artist, Archipenko founded his own art school in Bearsville, New York, and taught at various institutions across the United States, including the New Bauhaus in Chicago. Archipenko's greatest and best-known contribution to the vocabulary of modernism lay in his reassessment of the relationship between solid and void, notes Professor Leshko. "This manifested itself in the exploration of concave/convex forms, and especially in his substitution of a void for a head or a torso - his most important and radical innovation." In his work Archipenko explored the world of entertainment from circus to boxing to dance in sculptures like Medrano I (1912-14), Medrano II (1913), Boxers (1914), and Dancers (1912). He addressed historical figures, for example, his late masterpiece Cleopatra (1957), and also touched on religious themes. Archipenko actively experimented with color and with a variety of materials. He invented a new category of "sculpto-painting" to investigate the symbiosis between painting and sculpture. His later works of the 1950s and 60s responded to the possibilities presented by new materials such as Formica and Plexiglas, taking them as both a resource and a challenge to be incorporated into his work. As his late sculptures Queen of Sheba (1961) and King Solomon (1963) demonstrate, Archipenko continued until the end of his career to pursue his abiding interest in the figure with new variations on familiar forms. As the artist wrote in his book Archipenko: Fifty Creative Years, 1908 - 1958, "my old works contain elements of the new, and the new contain elements of the old." The exhibition Alexander Archipenko: Vision and Continuity celebrates the continued dialogue of forms and themes that characterizes Archipenko's body of work. Adds Professor Leshko,"The exhibition affords visitors an opportunity to explore and experience the creative breadth and sheer beauty of the art of one of the 20th century's most influential and innovative sculptors." Following its showing at the Smith College Museum of Art, Alexander Archipenko will travel to the Chazen (formerly Elvehjem) Museum in Madison, Wisconsin, where it will be on view from August 26 through November 26, 2006. Widely regarded as one of the most distinguished college museums in the country, the Smith College Museum of Art is best known for its 19th- and 20th-century European and American collection. In addition, it is developing holdings in Asian, African, and Latin American art. The permanent collection features works by Manet, Monet, Picasso, Copley, Eakins, Stella, Motherwell, and O'Keeffe, along with noteworthy sculpture and classical antiquities. Visitor amenities include two artist-designed restrooms, eleven hand-crafted gallery benches, the Museum Shop, and Sam's Cafй at the Museum. Museum hours are 10-4 Tuesday through Saturday and noon-4 on Sunday. The museum is closed on Mondays and major holidays. Admission is $5 for adults, $4 for seniors, $3 for students with ID, and $2 for youth ages 6-12. Admission is free for museum members and for the Smith community, as well as for Five College students and faculty and all children five and under. Free passes are available at Forbes Library with a Forbes library card (20 West Street, next to the Smith campus). The Smith College Museum of Art is located on Elm Street at Bedford Terrace in Northampton, Massachusetts. For additional information about museum programs, parking, directions and amenities, please call 413.585.2760 or visit www.smith.edu/artmuseum.